This week’s Sunday Brunch reflects upon the Chinese diety for the large seafaring communities of the South China Sea and Taiwan Straight, Mazu. This past Monday, May 11th, Mazu celebrated her 1,055 birthday. Guest contributor Bryce Barros was in Taipei City, and brings you this maritime cultural phenomenon first hand. This past Monday, May 11th, many in the southern Chinese Provinces of Guangdong, Fujian, Hainan, Hong Kong, Macau, Zhejiang, overseas Chinese communities in Taiwan and throughout Southeast Asia, celebrated the birthday of the Chinese patron goddess Mazu. Mazu, whose name literally translates as the “Mother Ancestor (媽祖),” is the goddess that protects seafarers, fishermen, and sailors. Mazu’s role closely ties her with the Chinese in southern mainland China, and throughout Southeast Asia; as they’re ancestors of many Chinese who were seafarers, fishermen and sailors in ages past. Mazu was a real person, like many Chinese Daoist gods and goddesses. She was born as Lin Mo-Niang (林默娘) to a family of fishermen. Mazu is believed to have been born in the year 960 AD on Meizhou Island, Putian County, Fujian Province. Furthermore, she died in the year 987 AD. Mazu throughout her life became widely known for her excellent swimming abilities. According to legend, she would stand on the coast wearing red garments to help guide vessels back to port – even in dangerous weather. Chenlen Temple, Taiwan, dedicated to the goddess Mazu. Furthermore, Mazu’s legend states that during a devastating storm, her fishermen brothers and father were at sea. Understandably, the family began fearing for the worst, so Lin Mo-Niang began to pray. After falling into a deep trance of prayer, she began dreaming of her brothers and father. Soon her mother tried to wake her up, consequently causing Mazu to drop one of her brothers and leading to his drowning. The next day the father and some of her brothers returned home; revealing that one of her brothers had drowned just as her dreams were portending. 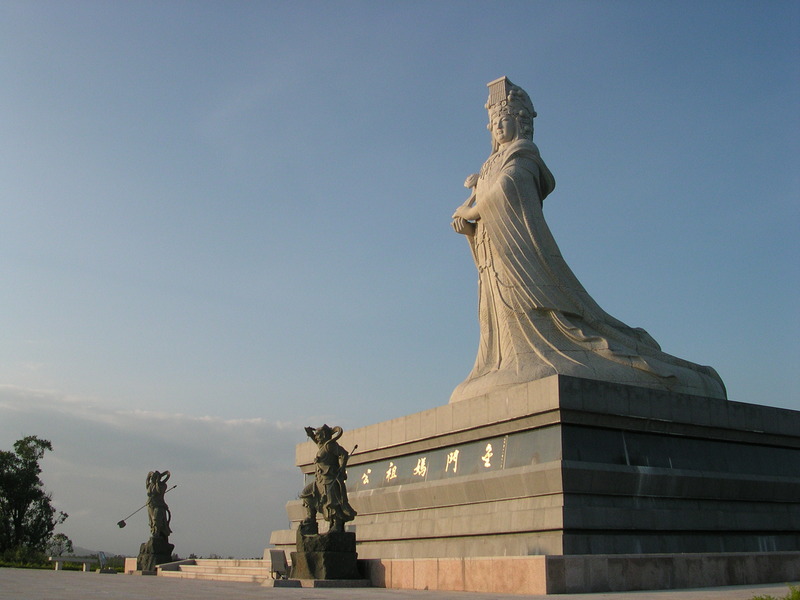 Mazu’s legend earned her immense reverence amongst her fellow Fujianese; furthermore soon spreading throughout the southern coastal provinces of mainland China. Taiwanese are largely descended from seafaring Fujianese, like Mazu’s brothers and father. Mazu’s place within Chinese seafarers was secured, as significant immigration in the 1600’s from Fujian Province to Taiwan took place. Wherever Fujianese settlers made homes, temples, and pagodas – shrines to Mazu followed. The Taiwan Strait in particular remains a very volatile body of water. Therefore many Taiwanese connect to her legend, by embracing the fact their ancestors faced similar plights crossing the Strait. Mazu’s birthday is celebrated by Chinese Buddhists and Taoists throughout the world, however she remains most revered in Taiwan. Each year, beginning weeks before her birthday, many Taiwanese hold celebrations day and night welcoming the goddess’s presence into their homes. Pilgrimages occurring all over the island are common, seeking to reach temples where she’s worshiped. Mazu’s Birthday celebrations include large processions where a statue of Mazu is carried on a palanquin; flanked by devoted worshipers, fireworks, loud traditional Chinese and electronic music. These boisterous displays are encouraging the goddess to come out and make her presence known in homes of the locals.